This product is made in a factory that also handles Gluten, Peanuts, other Tree Nuts, Sesame Seeds, Milk Products, Sulphites and Soya. Our Cashew Nuts are deliciously Roasted & Salted & made from the finest quality ingredients. 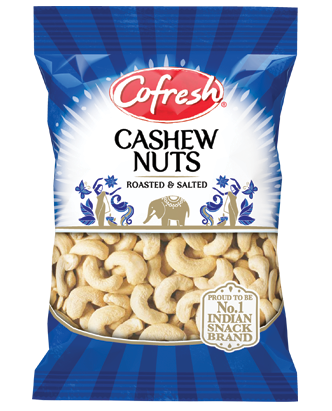 Cofresh snacks are all vegetarian and are additionally gluten-free or Kosher when possible - ranging from traditional Indian snacks and flavoured potato crisps, to 'all-natural' cereal bars. They are eaten by over 1.5 million consumers every week in the UK alone, with world-wide demand increasing fast.